LOUISVILLE, Ky. - A 16-year-old was arrested Tuesday in the shooting of a high school student that prompted a school-wide lockdown and evacuation, police in Louisville, Ky., said. Sgt. Phil Russell said the alleged shooter was picked up about three hours after a Fern Creek Traditional High School student was wounded Tuesday afternoon. CBS affiliate WLKY reports police say the suspect is also a student at the school. The wounded student had non-life threatening injuries and was reunited with parents at University Hospital, Russell said. He didn't say if the injured student and shooter knew each other or if the shooter was a student at Fern Creek. Russell said the suspect left the 1,400-student school immediately after the attack. Rhodes, who said she has a class with the student who was shot, said she ran from the room and away from the sound. After a few minutes, students were herded back into the classrooms and the doors locked. The police came and told everyone to get on the ground and stay away from the door. 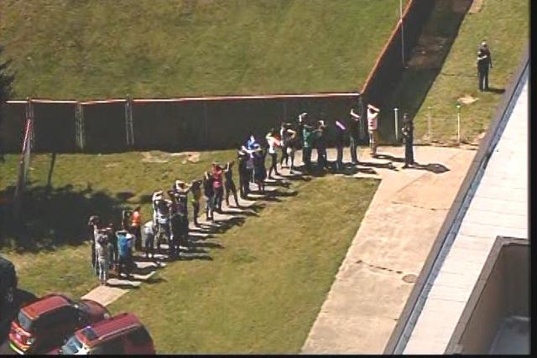 Jefferson County Public Schools spokesman Ben Jackey said the school went into lockdown following the incident. After police arrived, students were led out before being taken to a nearby park for dismissal.